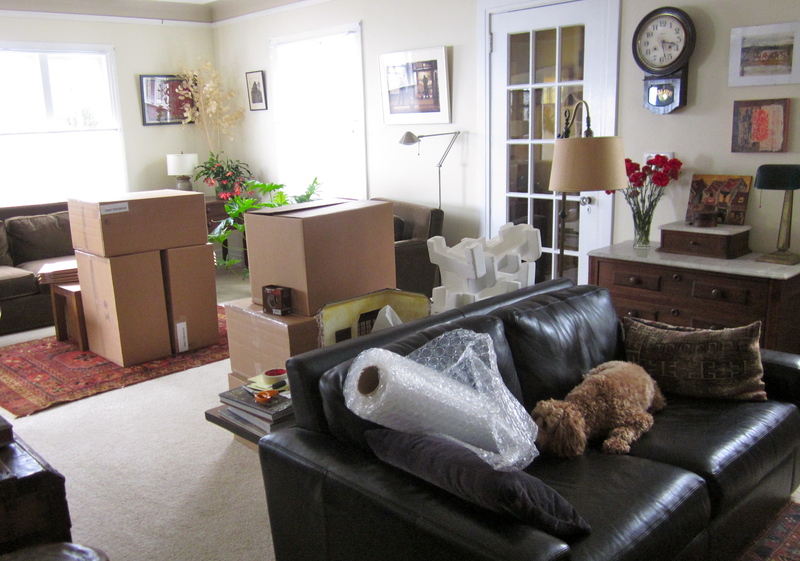 It must be May, our living room is full of packing boxes, bubble wrap and foam. We are prepping for our last teach-a-thon at The Guild School. 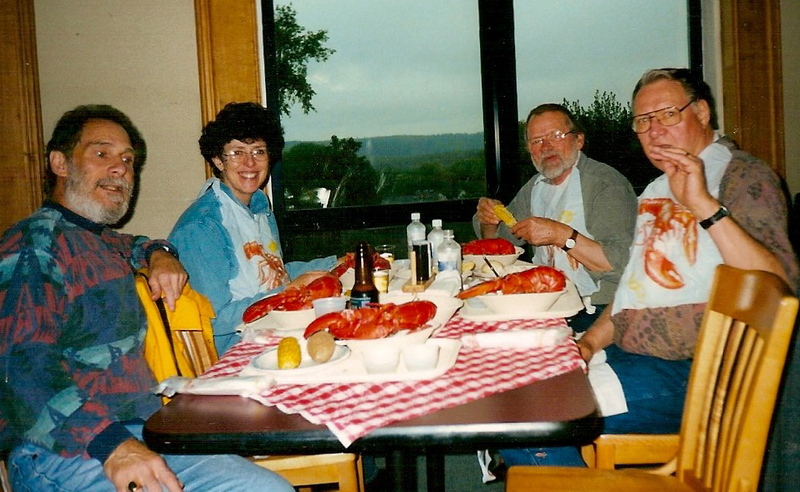 Thirty years ago, Don Buttfield and a group of like-minded miniaturists started the International Guild of Miniature Artisans (IGMA) School at the Maine Maritime Academy in Castine, ME, to teach miniatures as an art form. The following year we were asked to speak to the gathering and teach a 6 hour class. We weren’t quite sure what it was all about, but we liked the people, and looked forward to spending a couple of weeks on the Maine coast. Other than last year, when we took a time-out to repair Noel’s heart, we have made the trek and taught there every summer since. I say “made the trek” as it takes three days and more than some tenacity to get from Astoria to Castine, not to mention the 12-14 boxes of structural pieces, tools and materials. There is an old Maine adage that goes, “You can’t get there from here,” and travelers from around the world to Castine will attest to their almost proving that thesis. Almost. It is, however, more than worth the journey—there are so many friends to visit with, so much lobster and ice cream to eat.. This year, our stand-ins will be making the final journey with us. “Leroy” and “Patty” are a pair of cedar figures that look a little like miniature chainsaw carvings—nothing fancy, but they are design tools we have used for years. It began with Leroy, a hands-in-the pockets kind of guy Noel carved one night to help determine ceiling height in a winding stairwell. 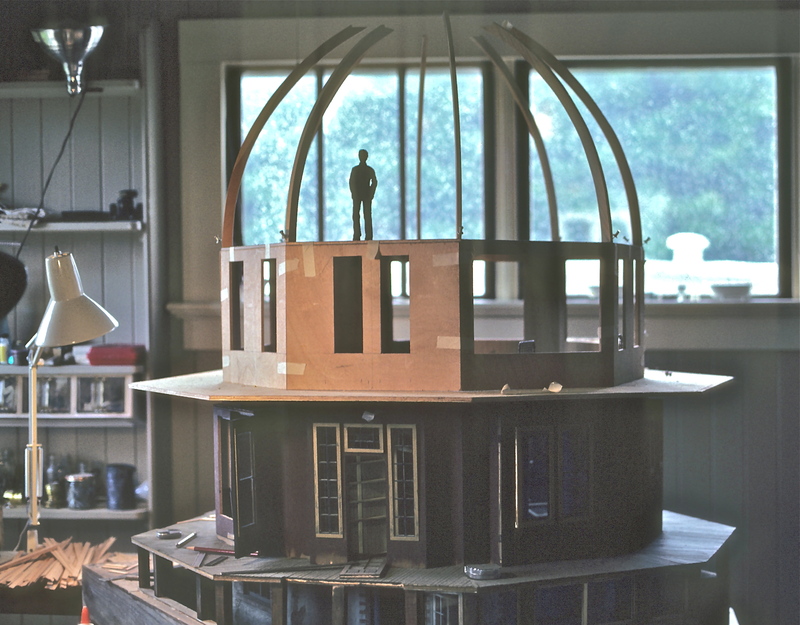 Our first photographic record of Leroy is in the Octagon House in 1982. Being proponents of “eyeball geometry,” we needed something to, literally, stand for us in our miniature structures to see if we had good ceiling clearance, or sufficient elbow room in doorways and stairwells, and Leroy was it. If it looked right with Leroy, then we were good to go. 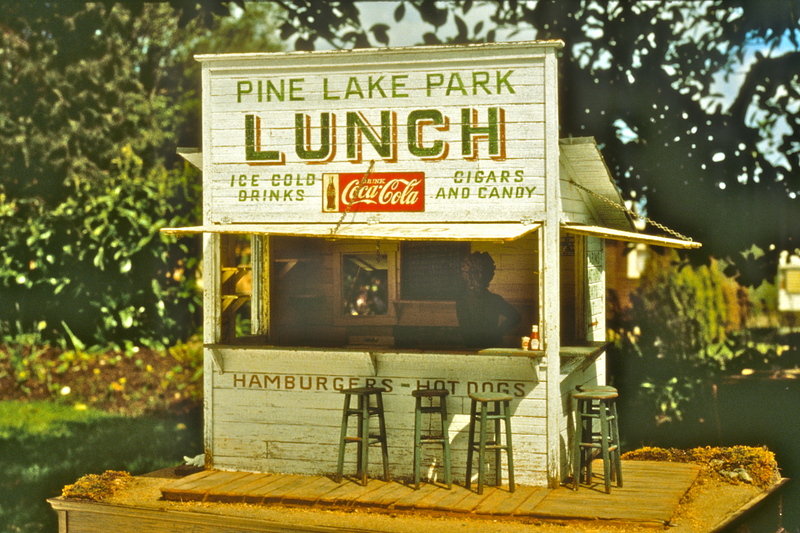 Leroy also became the patsy for anything that went wrong—crooked shingles, molding “cut three times and it’s still too short,” glue that refuses to dry. Poor Leroy, we treated him miserably, and he just stood there, the utter stoic. Noel is quite clear on the fact that the figure is Leroy, not Noel, but if you look at two of them together, I think you’ll see a chip off the old block. One morning I came down to let out the dog and found a new carving on the table, a female figure standing in one of my characteristic poses, one elbow out, hand on hip. The other arm made me look like I had a stomach ache, or a broken arm, but she had my hair, and was wearing my work apron. Noel said she was “Patty,” so Patty she was, and is–Leroy’s right arm (broken or shriveled as it is) buddy. She has the same weird apple-doll smile as Leroy, maybe from a poor diet and long nights standing up in the dark. They don’t get out much, and it shows. I do think we were kinder to Leroy once Patty came along, she looks like she doesn’t suffer fools gladly. 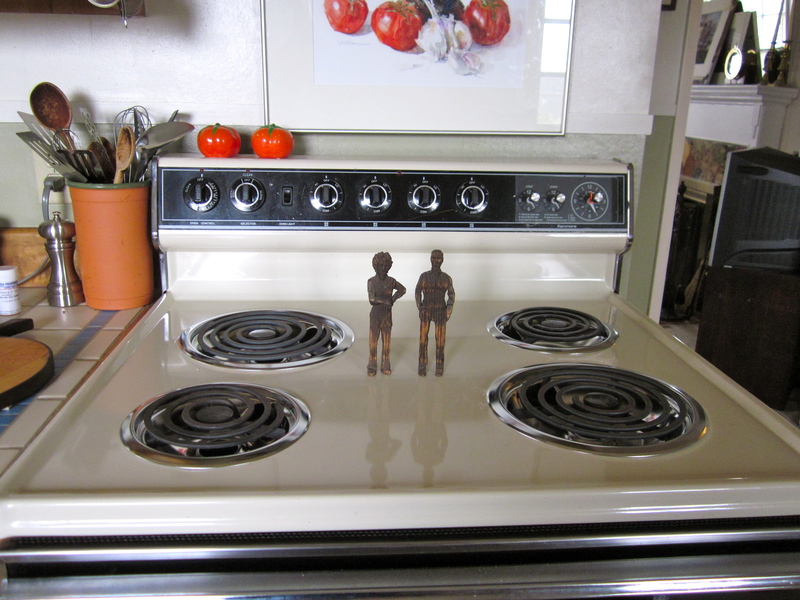 Leroy & Patty sizing up some apartment-size appliances. Leroy and Patty have stood by us through the thicks and thins of more than 30 structures, and this year we are donating them to The Guild School Auction—one of the highlights of the school week, raising funds for the scholarship program. As with many Guild Artisans, over the years we’ve donated some of our best work to the auction–this year it will be perhaps our most freakish, but hey, one year they auctioned off a bag of Cheetos for an astronomical sum, just because a couple of friends decided to duke it out over neon orange snacks. As we say goodbye to all that the Guild School is, and is to us, we’re hoping for the best, and for a perhaps more relaxed life for Leroy and Patty—they deserve a vacation. 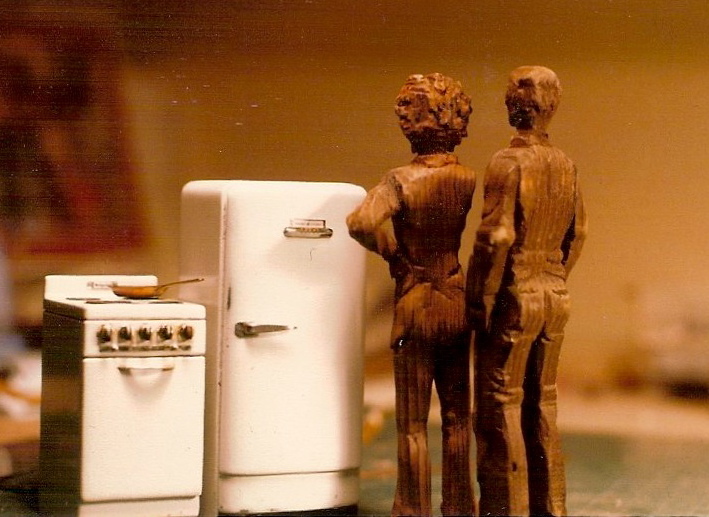 This entry was posted in Bio, Miniatures and tagged Castine ME, dollhouses, friends, IGMA, Leroy & Patty, miniatures, the Guild School, tools, work style. Bookmark the permalink. Noel and Pat, just got this website from Corky’s posting to Petitpointers. I didn’t realize this was to be your last year at Castine, and I’m not even going to be there. We have our house in Boulder for sale, and I couldn’t commit to attending Castine this year. I treasure the experience of having been in one of your classes, and want to wish you both the best in your retirement. Have a wonderful last week in Maine, and then may you enjoy a long and healthy retirement together. Sorry we won’t see you there this time, Sue, and thanks for the good wishes. It’s going to be odd without Castine on our calendars.